Brown assumes only so many shades in central Texas. 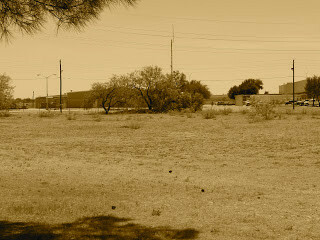 I look at my surroundings, and I see light brown, straw-like grass sprouting from dust only a hue deeper. Wherever I drive or run, I see the same sparse shrubs and brush. Even the exteriors of the houses here are the same sandy, monochromatic brown as the lawns (dirt?) that envelop them. The view from our apartment. Indistinguishable from the rest of the town's landscape. I hate the brown. I hate all that the brown symbolizes: death, resignation, contentment with failure and the status quo, dryness, fear of innovation and vitality, safety, sameness. I hate walking barefoot and feeling the sharp prickle of brush on the pads of my feet before it snaps. I hate jogging past the yards filled with rocks and cacti, unapologetic admissions of surrender to the heat. I hate entering the buildings here, where the insides are even more dark and unlively than outside. Windows are minuscule because to allow more than a sliver of light to peer through would compete with the nonstop blasting of the central air conditioning, perhaps raising the interior temperature from a cool and comfortable fifty-five degrees to an unbearably stifling sixty degrees. The same print set in sepia. Notice that the shade of the grass remains exactly the same. The only part of the picture that changes colors is the sky (although it is reassuring that our sky is not brown--count the blessings we do have). I miss the minty green of the Virginia grass, the lime hue of Alabama greenery. I miss the fresh green of the Southeast, its promise of liveliness and strength and perseverance and bliss and renewal. I miss stripping off my socks after a run and feeling the cool soft grass meet my sweaty feet and then spring perkily and determinedly back to place. My eyes miss the stimulation of the vibrant varied hues of foliage, flowers, grasses, and trees. I miss returning home to bright, light-filled rooms and looking out onto saturated green lawns, where homeowners do not care if the light causes a ten degree increase in the interior temperature because they prefer open windows to air conditioning any day. Doctors now identify seasonal affective disorder, and I seriously think I may suffer from vegetational affective disorder (VAD). I need to see trees--real trees, not the squatty shrubs that pretend to be trees in the prairie land--or I go a little bit crazy, as Dan can readily testify. Even back in high school, I apparently spoke about the relative abundance of green determining whether or not a particular location would prove suitable for living. I remember my brother answering "because of the pretty trees and flowers" when asked why his sister had chosen to attend University of Virginia. God must have decided that four years in Charlottesville had provided me with more than my fair share of oxygen, aesthetics, and contact with non-human living organisms upon sending me to Texas. I think I may need to spend another few decades in Virginia just to recover from my eighty-five days in the Land of Brown, the place where the air conditioners never sleep. I realize I sound snarky and uncharitable and listless and bratty right now, but it is the VAD talking. I blame it all on the brown.